A custom 3x5 inch printed square corner full color magnet packs lots of authenticity within itself because square edged promotional materials are considered far more reliable. A logoed promotional 3x5 inch printed square corner full color magnet is sought by marketers who have traditional as well as realistic approach towards campaigning. They know it can be utilized for brand building in creative ways. 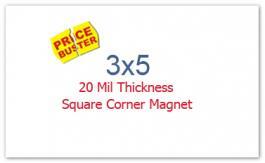 A personalized 3x5 inch printed square corner full color magnet presented as a discount coupon, sales coupon, announcing your mega sale bonanza, or some impressive graphics, stands higher chances of retention than regular promotional magnets. This magnet is highly value –effective against the investment and can be sought for bulk gifting during some marketing events.